You can’t light up a fire directly under the falling rain. Nor can you light the fire in the open if the weather is also windy at the same time. So the first thing you have to do is to find a sheltered spot which provides you cover from the rain or the wind. To do this, you can dig up a pit in the ground, find a spot against a rock face or get under the cover of the trees to find a spot which is sheltered. An important thing to consider here is that you should try to find an area of the ground which is wet. It will be lot easier to build a fire on such an area. So you can out in the open and everywhere around you, the trees and the twigs and the fallen branches are all wet. 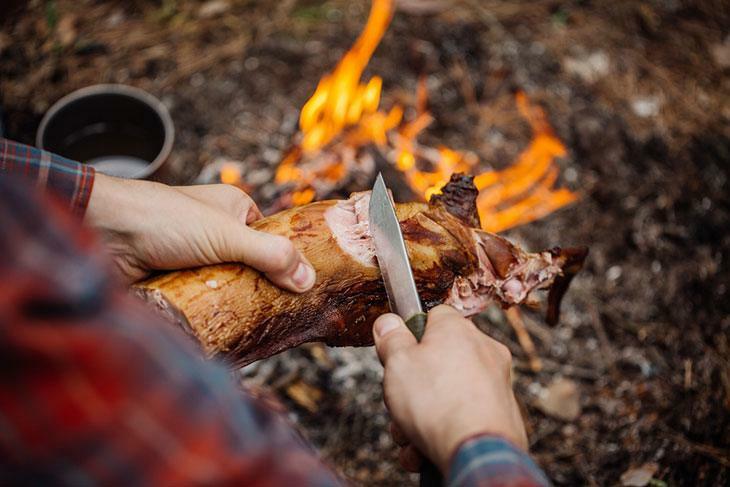 You bring out your knife and start working your way through the twigs and branches to reach the drier inner core of the wood. You can do this with small pieces of wood as well as larger limbs. Use your pocket knife to shave away the wet surface and uppermost layers. In most cases, the inner cores would still be dry. If you are unable to find dry ground, it is time for you to deal with wet ground. 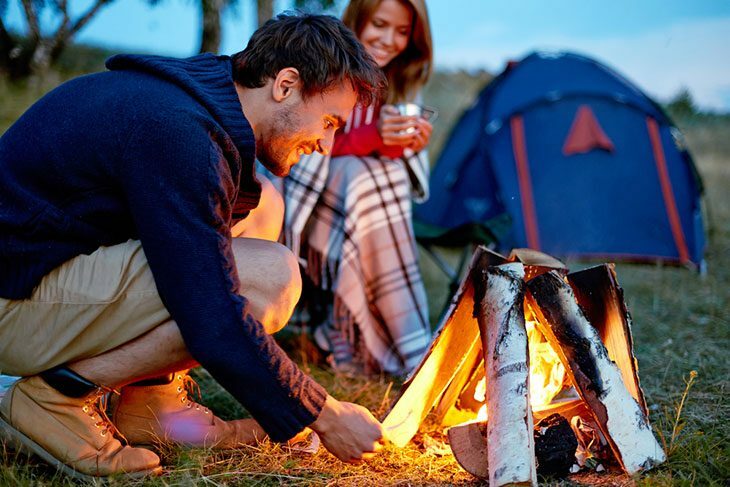 To build a fire on wet ground, all you have to do is lay down a foundation of dry wood. This doesn’t have to be a very large foundation. 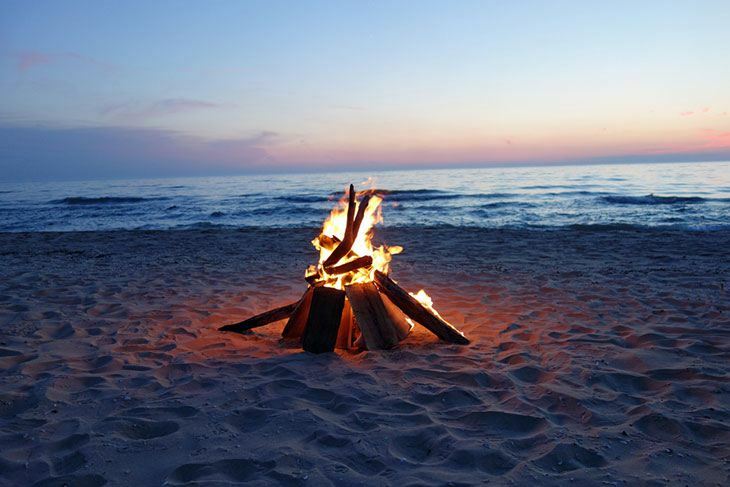 Just use hand-sized pieces of wood and lay then down raft-style to create a structure on which to build the fire. The tinder bundle is essentially the spark fuel that is going to initiate your fire and carry it to the rest of the wood you gather. It comprises of various materials that can readily catch fire. Look around you to find such materials. If you find a dry tree, you may find tinder-material just under the bark. In general, any material that is fibrous usually serves as quality tinder. When you are building a fire in wet or rainy conditions, it is better to be on the safe side. So gather up more firewood than you expect to use and have an over-abundant supply at hand in case you end up wasting some of the wood in the fire-building attempts. Besides, it is better to go scouring and searching for wood and gathering it up all at once instead of having to go looking for it again and again. Once you are able to build the fire, you can use the heat from the fire to dry up the pieces of wood which are not too wet. In rainy or wet weather, you must conserve your resources. So when you are building a fire, you should strive to built it in such a way as to maximize its efficiency. A good way to do so is to build your fire by gathering up the wood in a teepee like structure. This is an inverted-cone structure with an opening at one side and a hollow area inside. You essentially place the tinder bundle inside the hollow of this inverted cone whereas the cone itself comprises of the larger pieces of wood. Once you have the teepee in place together with the tinder bundle inside it, it is time to ignite the tinder. If you have a lighter or matchsticks, use them to light up the fire. If not, you should preferably have steel and flint at hand. In either case, you should have a fire source that you are comfortable with and can easily use. Start the fire with the tinder bundle. 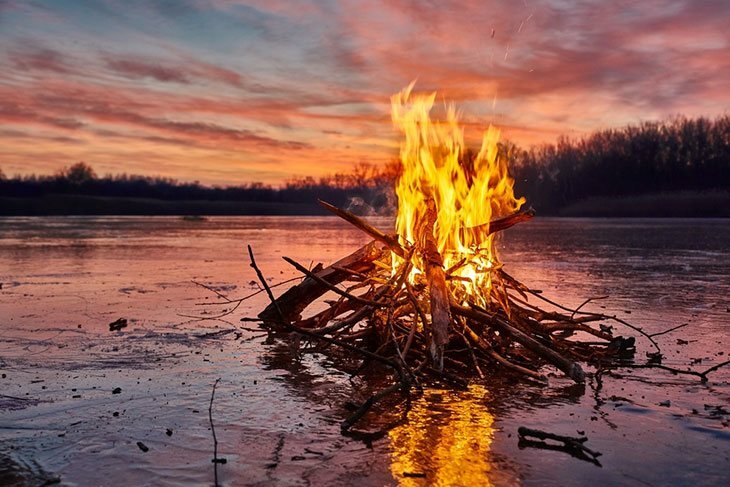 Make sure that the bundle is positioned so that once the fire is started, it quickly spreads to the structure of the teepee as well. If you have wet clothes, make sure you get them dry in front of the fire. 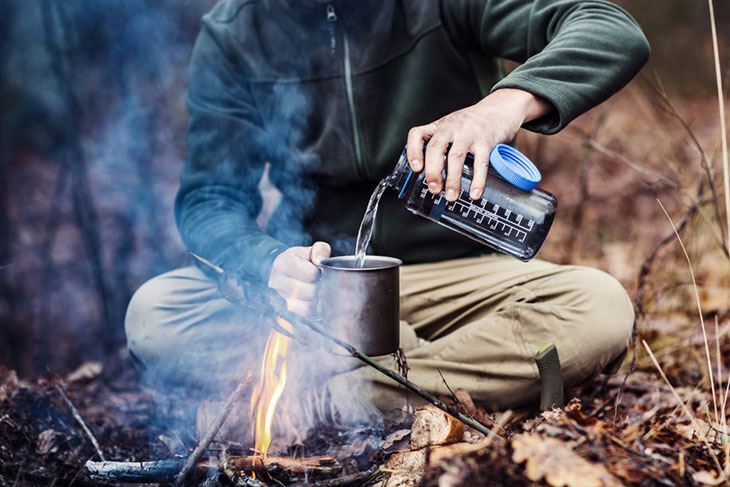 If you are going to spend a few hours out in the open, wet clothes may give you a fever. Take off your socks and shoes as well and dry them up before putting them back on. As mentioned above, also position your supply of firewood near the burning fire so that it remains dry and ready for use when you need it. If you don’t want to undergo the hassle of rebuilding the fire, make sure you add firewood to the fire before it burns out. Apart from the teepee structure, you can also build fire on a rainy day use other types of structures. For instance, once you have built the base, place two sizable limbs of wood in parallel position but at some distance from each other. Between them two limbs, position your tinder bundle. Now start placing sticks horizontally on the parallel limbs so that you create a kind of raft. Next, place another layer of bundles perpendicular to the original layer. You can pile up quite a few layers of wood and the beauty of this structure is that it is incredibly easy to build. Once you have the structure, light up the tinder bundle at the bottom and it will automatically cause the sticks piled above to catch fire.